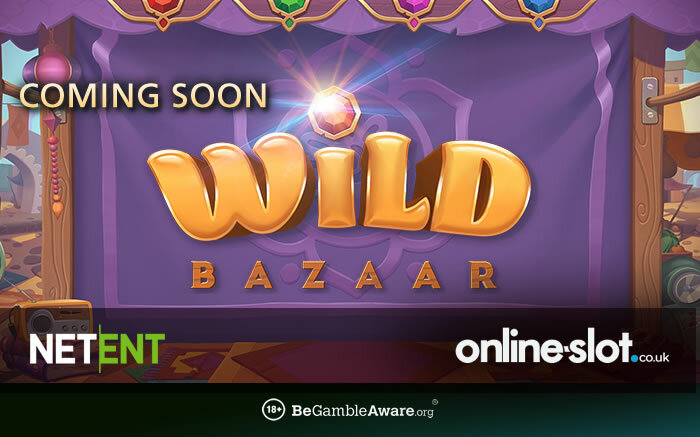 One of the new slots we’re really looking forward to giving a spin this autumn is Wild Bazaar and Net Entertainment has given us a taster of what we can expect from this trip to the souk after releasing a YouTube preview. First impressions in this 5 reel, 26 (yes, you read that right, there are 26 paylines) are good. NetEnt slots are usually easy on the senses and Wild Bazaar is typically well designed. The setting is a Middle Eastern street market with the reels set within a wooden stall. You’ll see 4 lower value jewellery symbols on the reels alongside 4 higher value treasure chests. These higher payers all offer the same payout which tops 7.5 times your stake if you land 5 on the same payline. The gameplay here looks a little unusual. You’ll notice we haven’t mentioned anything about scatters. There aren’t any. The bonus features are triggered by landing a winner made up of the higher value treasure chests. You’ll then be awarded 3, 4 or 5 respins depending on whether you landed a winner made up of 3, 4 or 5 symbols. A wild modifier is in play during the respins too. Which one you get depends on the colour of the treasure chest on the triggering spin. Goodies on offer here include 4-high stacked wilds that can appear on all 5 reels, colossal 2×2 wilds, linked wilds that form a chain between the leftmost and rightmost wild and a wild multiplier that doubles the payout whenever it forms part of a winning combination. We’ve seen all these wild extras in other slots but not packaged together. Combined they deliver plenty of action and more than make up for any lack of a traditional Free Spins feature. The high spec visuals we’ve come to expect from NetEnt is present and correct in Wild Bazaar and the Arabian-style backing track conjures up the atmosphere of the souk rather nicely. Coins of Egypt is a 5 reel, 20 payline slot where you head to ancient Egypt from just 20p per spin on all devices. There’s a Pharaoh Coins Win feature where up to 15 times your stake for coin will head your way. In the Free Spins feature, there’s infinite free spins with coins filling chests for even more cash bonuses. Moonshine Riches is a 5 reel, 9 payline game with a jazz theme that can be played on all devices from 9p per spin. There’s a Ricochet Reward feature where symbols change into a randomly chosen symbol for guaranteed payouts. There’s also a Territory Takeover Spins feature where you begin with 5 free spins on a 5 reel, 1 row win both ways reel set – wilds are sticky and more free spins are up for grabs. With the multiplier increasing with each free spin, you won’t come away empty handed as the Bootlegger’s Bounty Bonus feature will kick in to guarantee you a prize of up to 75 times your stake. Fire Siege Fortress is the latest release and has 5 reels and 576 ways to win. Playable from 20p per spin, you take on fortress cities in this medieval themed offering. Central to the action are 3 wild window feature which reward you with Giant Wilds, expanding wilds and random wild symbols. They can come into play on every free spin in the Fire Siege Free Spins feature where up to 18 free spins are up for grabs. The Fire Free Spins feature gives you 3 free spins and the Tower Coin Win feature will give you cash bonuses. Not played at Mr Smith Casino yet? Sign up to deposit and stake in order to get up to 200 cash spins on NetEnt’s Starburst – these come with no wagering requirements whatsoever.